Our Test Kitchen sure does bake a lot of cookies, and over the years we've collected quite a few favorite tips and tricks. If you've ever wondered how to bake soft sugar cookies, or how to tell when your cookies are done, then these tips will surely help you out. These general tips apply to making and baking all types of cookies, so read along and get bakin' today to put them into practice! Always read a recipe completely before beginning, to be sure you understand the whole procedure. This will eliminate any surprises. Gather all ingredients before beginning. Nobody wants to have to run to the store halfway through a recipe. Unless specifically stated otherwise, ingredients are best when used at room temperature. This is true except in very hot kitchens. The number of eggs called for in most recipes is based on U.S. graded large or extra-large eggs. You can use butter or stick-type margarine unless otherwise instructed. Butter adds more flavor. If oversoftened, set it aside for other kitchen uses and use fresh for baking. Mix dough evenly, making sure ingredients are combined uniformly. This is true except in recipes that state otherwise, such as marbleized items. Overmixing can cause cookie dough to harden, so do not overmix! To prevent the motor on your portable hand mixer from burning out, pay attention to how hard it is working. Cookie doughs tend to be stiff. You can almost always stir in your final dry ingredients by hand if necessary. For best results, grease pans as directed in each recipe. This will ensure easy removal of cookies. Always preheat the oven. Putting an item into a cold oven will alter the baking time and the consistency of the finished product. To allow for the most even heat circulation, it is best to bake cookies and bars in the center oven rack position. Also, do not overcrowd the oven. It will cause uneven baking, resulting in underbaked or burned cookies. If baking two or more trays at the same time, it’s best to place both pans into the oven at the same time, and switch the pans once during baking. Never place raw cookie dough on a hot cookie sheet. 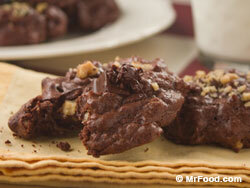 If using the same cookie sheets for several batches, always allow them to cool between uses. Always check cookies after the minimum suggested cooking time. Remember, cookies continue to bake after they’re removed from the oven, so be careful not to overbake. A good rule of thumb is: Crispy, thin cookies are done if they’re firm to the touch and golden around the edges. 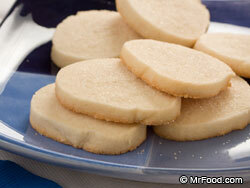 Thick or moist cookies are done when you can press them lightly with your finger and leave no imprint. Brownies and bars are done when they pull away slightly from the sides of the pan, or when firm to the touch with a little bounce (but not loose) when lightly pressed in the center. Use a timer to help keep track of cooking time. 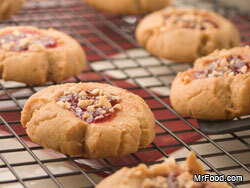 It’s easy to get distracted – and, if you do, your cookies can be overdone before you know it. Always use pot holders or oven mitts when handling hot pans. Place hot baking pans on a cooling rack to allow air to circulate completely around pans. This also helps prevent damage to countertops. If cooled cookies stick to a cookie sheet, return the pan to a warm oven for about 1 minute, then immediately remove the cookies with a spatula. Test your oven temperature regularly with an oven thermometer to ensure proper calibration. Oven thermometers are usually available in supermarket housewares sections, and also in most kitchen stores. Clean up as you go along so that your time in the kitchen can be enjoyable and kept to a minimum! I read these recipes as though I was reading a good book . Mostly, I bake many of them in my head and thoroughly enjoy it. I'm almost 90 and my baking days are not quite over. I still bake about once a month, then give it all away. I'm still pretty good!!! Good for you! Thank you for your comments and keep doing what you love! Enjoy! All great tips,,, guess my home ec teacher knew what she was talking about. I passed them on to my daughter.